One of the kissing couple shelf sitters made by Ceramic Atrs Studios of Madison Wisconsi. She wears a two tone blue dress and has black hair. All puckered up and no one to kiss!! We do not have her mate. She is 5" tall and in perfect condition. 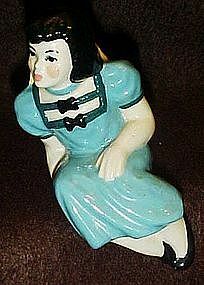 See all of our other Ceramic AArts figurines listed.